Water resource managers and urban planners can use this dashboard to access maps and data that help them monitor the potential for extreme precipitation and drought in their regions. A similar set of information is available via an Esri Story Map, Climate Information for Water Utilities. The Climate Resilience Toolkit's Acknowledgments page lists the individuals who contributed to this collection. Note that this is a dynamic page: the scope and content of dashboard entries are driven by input from users. We welcome your suggestions and additions to improve its usefulness. Please email us with your suggestions. View current conditions and short- to medium-range (1-7 days) forecasts for precipitation, temperature, wind, and clouds. These forecasts often identify potential hazards such as heavy precipitation three or more days in advance. View forecasts of cumulative precipitation for periods from 6 hours to 7 days into the future. Monitoring this site can alert decision makers of the potential for wet weather and/or flooding. The National Water Model (NWM) forecasts streamflow over the entire continental United States. The system models physical processes such as snowmelt and infiltration to determine how much precipitation forecast by NWS will become runoff, then route that runoff through the river network to simulate discharge levels. This site shows the chances for Severe Weather and Fire Weather over the next 8 days. Browse a range of information on severe weather events including tornadoes, thunderstorms, winds, and hail. Maps show how conditions related to drought are likely to change over the valid period. 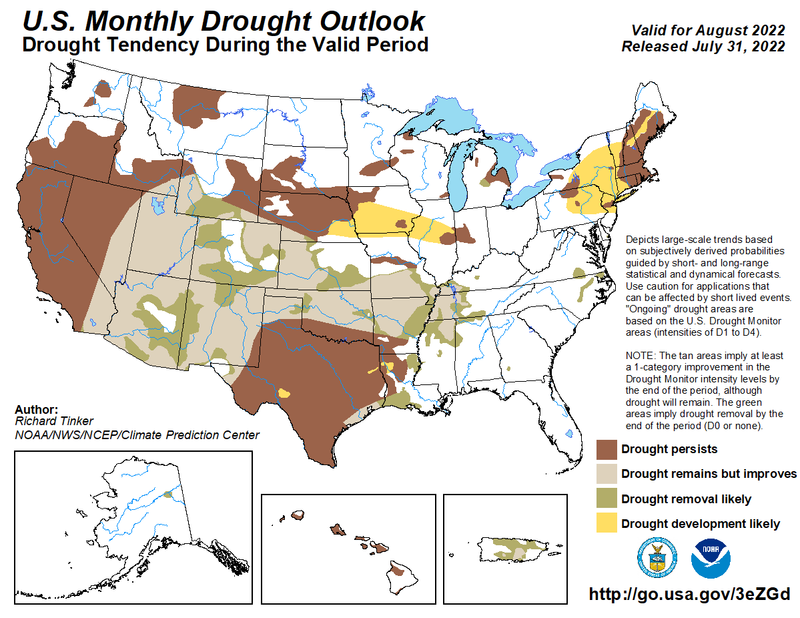 Outlooks indicate areas where drought is likely to develop, persist (or worsen), improve, or end. Hazard outlooks for the next 3-7 and 8-14 days. Get advance notice of the potential for flooding, severe storms, extreme temperatures, drought, and risk of wildfires. Explore graphs and maps of historical and projected temperature and precipitation variables for any county in the contiguous United States. Additionally, view graphs from individual weather stations and coastal tidal gauges. View monthly maps showing the probability for precipitation ranking in the top, middle, or bottom third of historical observations. Outlooks that favor drier or wetter periods can raise awareness of the potential for changing conditions. 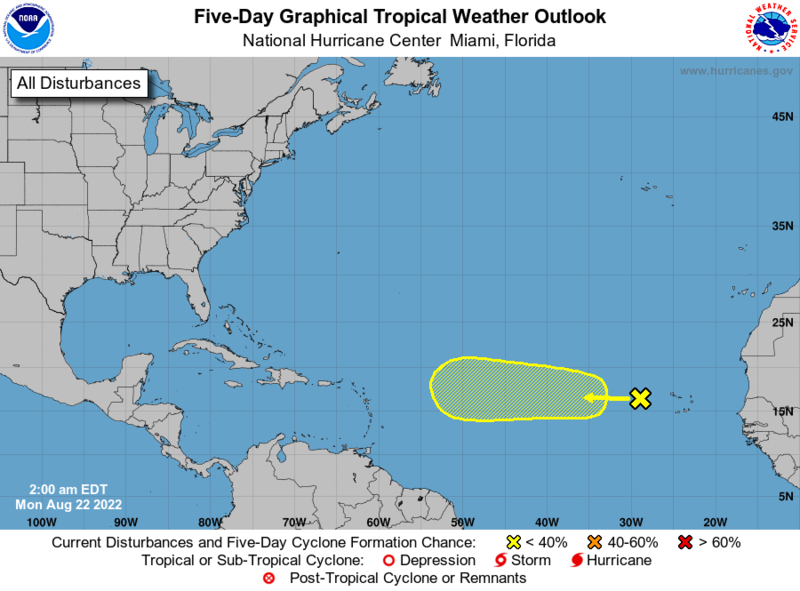 The National Hurricane Center monitors marine weather and indicates the chance that disturbances will develop into tropical storms. For storms that do develop, the site shows predicted paths and storm status. Monitor this site to be aware of the potential for tropical storms and/or hurricanes. Check the probability that cumulative rainfall will exceed user-defined thresholds within the next three days during 6- to 24-hour intervals. This forecast can serve as an early alert for potential flooding. This interactive map shows regions where the risk of having a seasonal extreme in temperature or precipitation is elevated during El Niño or La Niña conditions. 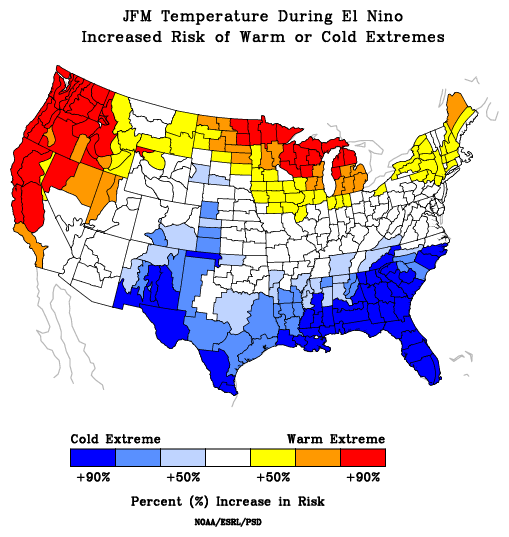 Decision makers can identify areas that have an increased or decreased risk of extreme warm/cold (or dry/wet) seasons, and plan accordingly. This site offers maps, animations, and plots from weather observations and prediction models. The graphic products for Model Guidance, Observations and Analyses, and Tropical Guidance can be useful for monitoring development of potential storms. Colors indicate current streamflow. Click any region on the site, and then click individual stations to access graphs or raw data on streamflow and precipitation. This display can help water managers judge short-term future supply. View current and predicted flood status at more than 7,500 gauges in the United States. Click to zoom in on a region, and then roll your cursor over gauge locations to view hydrographs of recent and forecast discharge levels. View observed flow conditions across 13 regions of the contiguous United States. For each gauge location, access hydrographs showing observed and predicted water levels that account for upcoming weather and snowmelt. This weekly map—updated every Thursday—shows experts' assessments of regional conditions related to dryness and drought. The maps focus on broad-scale conditions, so local conditions may vary. Access maps that show estimates of surface soil moisture. View Total, Anomaly, Percentile, or Change in soil moisture over the last month or season. Monitoring this site can help decision makers judge field conditions and the potential for drought development. WATERS (Watershed Assessment, Tracking, & Environmental Results System) provides comprehensive information about the quality of surface water across the nation. Maps and animations show snow analyses for 18 regions of the contiguous United States. For specific weather stations, graphs show observed and modeled snowpack to estimate the amount of water stored as snow. Daily maps show the extent of snow cover (and ice) over the contiguous United States, Alaska, or the whole Northern Hemisphere. Images are embedded in an animation tool that enables users to identify daily changes and seasonal trends. This daily map shows snowfall accumulation reported at individual stations across the contiguous United States. Access summary observations from more than 90,000 land-based stations around the world. Data may include precipitation, maximum and minimum temperature, temperature at the time of observation, and/or snow depth. A How-to Guide provides assistance with selecting stations of interest in the map interface. Use this GIS interface to select stations for which you want to view daily normals. Climate Normals are the latest three-decade averages of climatological variables, including temperature and precipitation. Hourly, monthly, and annual normals are also available. Use this GIS interface to select from more than 5000 stations that indicate maximum observed rates of rainfall. You can consult these records to see historical extremes for locations of interest. Access records of heat waves, droughts, tornadoes, and hurricanes. Explore weather records tied or broken for each day of the year, disasters that cost a billion dollars or more, and special reports and indices that characterize extreme events. Comprehensive access to drought monitoring resources, reports, and news from the U.S. Drought Community. Access the data, tools, and training communities need to address coastal issues, including sea level rise and flood exposure. Access resources for state, tribal, and local officials and other parties engaged in developing and implementing hazard mitigation plans.